Across Nebraska, you’ll find plenty of exciting outdoor activities and nearby many of these attractions are some incredibly unique places to spend the night. For your next trip, why not consider one of these unique spots to make your experience even more of an adventure? Here are 10 of the most unique hotels and accommodation options in Nebraska. The Lied Lodge & Conference Center is a massive 260-acre getaway located in the home of Arbor Day, Nebraska City. The exceptional timber architecture, world-class spa, and all natural setting make for a comfortable, cozy retreat! This boutique hotel nestled in downtown Omaha was modeled after a palace in Florence Italy—The Bargello. For a memorable stay and incredible views of the city skyline, the Magnolia Hotel is a must visit. If you want to experience Nebraska’s wildlife up close, the Comstock Premier Lodge is the place to be. The lodge features incredible 360-degree views of the majestic landscape where you’ll spot elk, deer, bison, and more. Fishing, hunting, and other outdoor activities can also be enjoyed nearby. Located in the small farming community of Bennington, just a few miles outside of Omaha, Oft’s Bed & Breakfast offers a unique stay in a historic home. The stunning Queen Anne style home was built in 1910 and guests can enjoy spending time on the beautiful wrap-around porch, balcony, and lily pond in a relaxing setting close to the city. Located just a few miles from the Scotts Bluff National Monument, Chimney Rock and many other great places to hike, fish and canoe, The Barn Anew Bed and Breakfast offers a unique stay in a renovated 100-year old barn. Guests can enjoy a warm breakfast surrounded by beautiful nature and relics from the Oregon Trail. Soaring 14 stories over downtown Omaha, the Hotel Deco XV is Omaha’s only boutique luxury hotel. The building was constructed in 1930 and the exceptional Art Deco architecture and decor create a unique and memorable experience. With more than 20 rooms available in a century-old mansion, the Plantation House Bed & Breakfast is the perfect place for comfort and relaxation. Five fireplaces, two winding staircases, and magnificent woodwork throughout the mansion ensure you’ll love your stay. 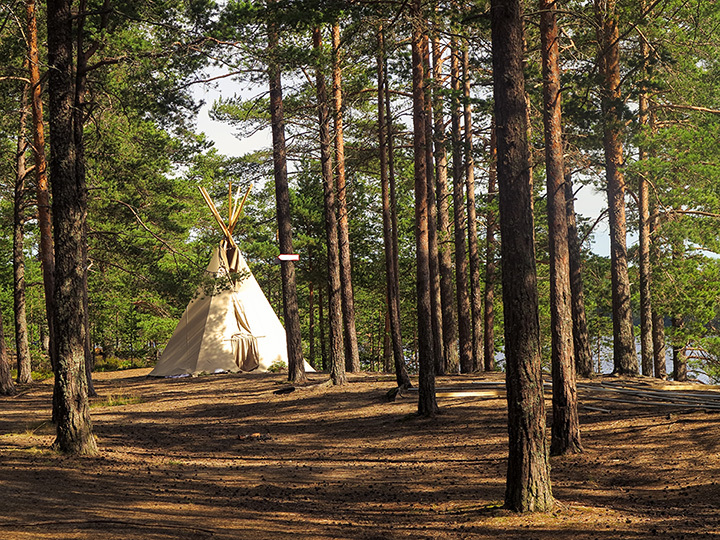 Ever wish you could camp out in a teepee? The Platte River State Park offers four teepees that guests can enjoy for a unique, rustic camping experience. The canvas structures have wooden floors and can accommodate six to eight people. The teepee village also features a fire pit for cooking and keeping warm! Spend a night on the “Mighty Missouri” with a stay at the River Inn Resort. This riverboat inn features a tranquil, unique way to unwind and explore the Missouri River as well as the nearby outdoor activities such as hiking, biking, and fishing. For some serious “glamping,” or glamor camping, the Slattery Vintage Estates tops the list. Each bungalow is furnished with antiques, soft bedding, lanterns, and is uniquely positioned to overlook the vineyards. Wine and cheese, s'mores, and foil dinners can also be purchased to complete the experience.